there does not exist a sufficiently practicable theory for selecting media appropriate to given topics, learning tasks and target populations . . . the most common practice is not to use a model at all. In which case, it is no wonder that allocation of media has been controlled more by practical economic and human/political factors than by pedagogic considerations (p. 56). When I am discussing the current state of technology with teachers around the country, it becomes clear that they feel bound by their access to technology, regardless of their situation. If a teacher has a television-computer setup, then that is what he or she will use in the classroom. On the other hand, if there is an LCD projector hooked up to a teacher demonstration station in a fully equipped lab, he or she will be more apt to use that set up. Teachers have always made the best of whatever they’ve got at hand, but it’s what we have to work with. Teachers make due. learner → teaching objective → intelligences → media choice. Mackenzie then allocates different media to support the development of each of Gardner’s intelligences. Gardner’s theory of multiple intelligences has been widely tested and adopted, and Mackenzie’s allocations of media to intelligences make sense intuitively, but of course it is dependent on teachers and instructors applying Gardner’s theory to their teaching. A review of more recent publications on media selection suggests that despite the rapid developments in media and technology over the last 20 years, my ACTIONS model (Bates, 1995) is one of the major models still being applied, although with further amendments and additions (see for instance, Baytak, undated; Lambert and Williams, 1999; Koumi, 2006). Indeed, I myself modified the ACTIONS model, which was developed for distance education, to the SECTIONS model to cover the use of media in campus-based as well as distance education (Bates and Poole, 2003). Patsula (2002) developed a model called CASCOIME which includes some of the criteria in the Bates models, but also adds additional and valuable criteria such as socio-political suitability, cultural friendliness, and openness/flexibility, to take into account international perspectives. 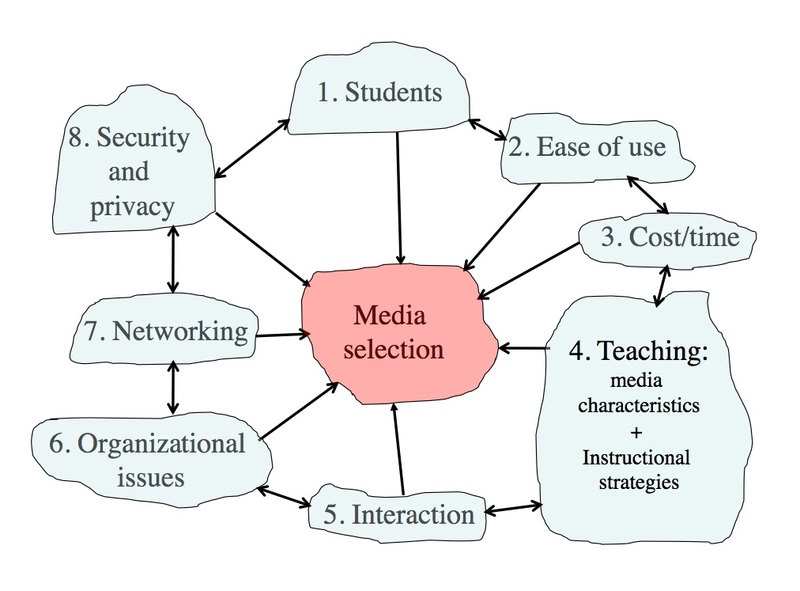 Zaied (2007) conducted an empirical study to test what criteria for media selection were considered important by faculty, IT specialists and students, and identified seven criteria. Four of these matched or were similar to Bates’ criteria. The other three were student satisfaction, student self-motivation and professional development, which are more like conditions for success and are not really easy to identify before making a decision. Koumi (2006) and Mayer (2009) have come closest to to developing models of media selection. Mayer has developed twelve principles of multimedia design based on extensive research, resulting in what Mayer calls a cognitive theory of multimedia learning. (For an excellent application of Mayer’s theory, see UBC Wikis.) Koumi (2015) more recently has developed a model for deciding on the best mix and use of video and print to guide the design of xMOOCs. Mayer’s approach is valuable at a more micro-level when it comes to designing specific multimedia educational materials, as is Koumi’s work. Mayer’s cognitive theory of multimedia design suggests the best combination of words and images, and rules to follow such as ensuring coherence and avoiding cognitive overload. When deciding to use a specific application of multimedia, it provides very strong guidelines. It is nevertheless more difficult to apply at a macro level. Because Mayer’s focus is on cognitive processing, his theory does not deal directly with the unique pedagogical affordances or characteristics of different media. Neither Mayer nor Koumi address non-pedagogical issues in media selection, such as cost or access. Mayer and Koumi’s work is not so much competing as complementary to what I am proposing. I am trying to identify which media (or combinations of media) to use in the first place. Mayer’s theory then would guide the actual design of the application. I will discuss Mayer’s twelve principles further in Section 5 of this chapter, which deals with teaching functions. It is not surprising that there are not many models for media selection. The models developed in the 1970s and 1980s took a very reductionist, behaviourist approach to media selection, resulting in often several pages of decision-trees, which are completely impractical to apply, given the realities of teaching, and yet these models still included no recognition of the unique affordances of different media. More importantly, technology is subject to rapid change, there are competing views on appropriate pedagogical approaches to teaching, and the context of learning varies so much. Finding a practical, manageable model founded on research and experience that can be widely applied has proved to be challenging. it will accommodate new developments in technology. I will discuss each of these criteria in the following sections, and will then suggest how to apply the model. 1. Choose a course that you are teaching or may be teaching. Identify what media or technologies you might be interested in using. Keep a note of your decision and your reasons for your choice of media/technologies. When you have finished reading this chapter you will be asked to do a final activity (Activity 8.10) and then you can compare your answers in the two activities after reading the whole chapter. 8.1 Models for media selection by Anthony William (Tony) Bates is licensed under a Creative Commons Attribution-NonCommercial 4.0 International License, except where otherwise noted.